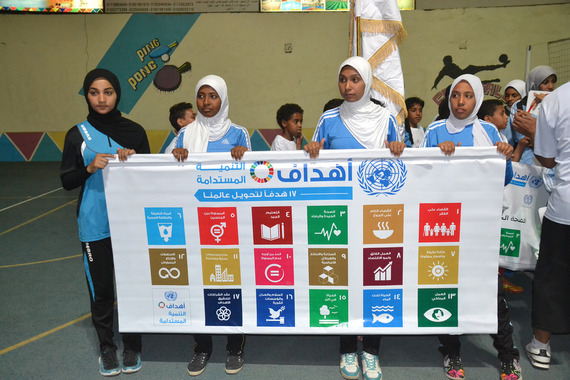 As the United Nations General Assembly begins a new session, the implementation of the Sustainable Development Goals (SDGs) is high on their agenda. The SDGs, which took effect earlier this year, have been described as "a universal push to transform the world." They represent a comprehensive plan of action to address some of the most pressing challenges to human development and the future of the planet. The realization of the 17 Goals (and 169 targets) by 2030 will only be possible if the role and participation of women is fully recognized and incorporated in the hard work of implementation. The 17 Goals range from ending poverty (Goal 1) and promoting inclusive and sustainable economic growth (Goal 8) to taking urgent action to combat climate change (Goal 13). Gender equality and women's empowerment (Goal 5) is not only important in its own right, but also has a crucial role to play across all the goals and targets. Significant progress on addressing poverty alleviation and sustaining economic growth, for example, will not be possible without the empowerment of women. A growing body of research shows that the vital source of growth needed to power economies will not be unleashed without greater participation of women in the formal economy. As the World Bank noted, "gender equality is smart economics." Achieving the SDGs, which are inter-dependent, requires a fully integrated approach and a focus on gender. The world is reeling from growing conflicts, violent extremism and terrorism, and the massive displacement of people that has led to historic numbers of refugees. The creation of peaceful and inclusive societies (Goal 16) will not be possible without the full participation of women in conflict prevention and peace-building at all levels of decision-making. Studies show that the prospects for conflict resolution and sustainable peace are significantly enhanced when women's voices and agency are fully tapped. The SDGs also recognize that violence against women and girls - in all its forms - is a global scourge that affects all of society and must be addressed in both the public and private sectors. The SDGs are also focused on climate change, one of the greatest ecological and environmental challenges of our time. Combating climate change will require political will, investments in innovative technology and the efforts of all people, especially women who are most severely affected and bear the brunt of the consequences of climate change. Women are not, however, just victims. They are critical to adaptation and mitigation efforts--critical to overcoming the vulnerabilities they confront. Although they are still largely excluded from decision-making mechanisms, they are creating innovative and localized solutions to build resilient communities. They are engaged in an array of initiatives from conservation adaptations to the installation of solar panels and clean cook stoves. By including and elevating their voices and providing them with access to critical resources, we will increase our global effectiveness in tackling climate change. Many stakeholders, including representatives of the private sector and civil society, are engaged in discussions at the United Nations to determine how best to create collaborative partnerships (Goal 17) that will contribute to successful and concerted efforts to implement the Goals. The realization of the SDGs is predicated on the sustained engagement of multi-stakeholders. The private sector, for instance, is recognized as critical to economic growth, jobs creation and inclusive prosperity. Women are powerful drivers of this economic growth, but they confront significant legal obstacles and discriminatory practices that constrain their workforce participation. Women entrepreneurs have limited access to credit, markets, training and networks. Today more companies are recognizing that women's economic participation is a core business strategy and are increasingly supporting women's economic progress through their value chains, supply chains, and training programs and leadership development. The SDGs also recognize the need to improve access to technology, particularly information and communications technology, in order to share ideas and foster innovation (Goal 9). This is especially important for women and girls who confront a pronounced gender gap in access to mobile technology and the Internet-essential tools for women's empowerment and access to 21st century jobs. If the digital divide is not closed, women will fail to benefit from the prosperity unleashed by the technology revolution and fall further behind. Gender equality and women's empowerment are essential for the realization of the SDGs. Implementation plans that do not reflect its centrality will shortchange the prospects for turning the UN's lofty goals into real progress for people around the globe--women and men, girls and boys. This not an option but a necessity.